In addition to the time actually spent in servicing the request, much time is spent in the communication and managing of the requests. In big companies, this time adds up to significant costs. In addition to virtually eliminating development costs, InfoSilk enables the user to service there own requests. These self service features are described in the Self Serve Breeds Success and the Customization Ease & Power articles. By enabling the business user to self-serve many of their reporting requests the savings in communication, management and development are significant. In addition the business user is happier because they get the data they need faster. 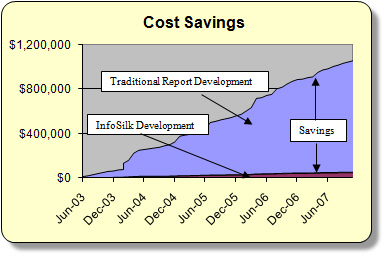 The chart below shows the savings a customer realized by using InfoSilk. We used a conservative estimate of $150 per reporting request saved. 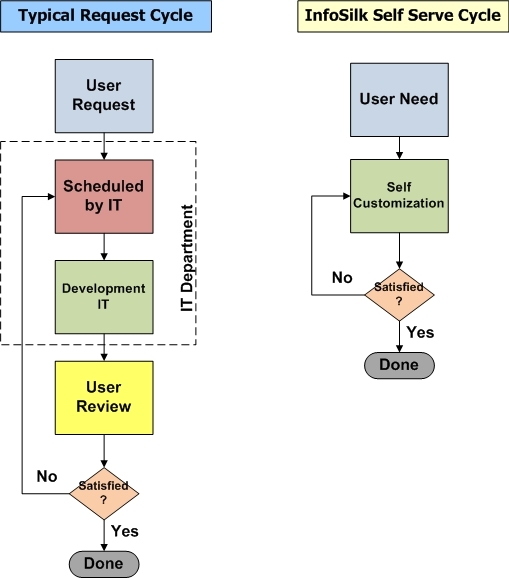 Offloading the report customization process to the user saves real money for the organization. This is in addition to the major benefit that the user gets the data they need. This entry was posted in devl. Bookmark the permalink.